My literary dresses are all one of a kind, made from iconic short stories or novels. They all measure about two inches across to about six inches long and come with their own handcrafted hangers. Some of them are for sale on our Etsy page. Miniature dress made from Flannery O'Connor's short story The Displaced Person with scavenged bird wings. Miniature steampunk dress made from William Gibson's cyberpunk thriller Neuromancer. Flapper miniature dress made from F. Scott Fitzgerald's short story Bernice Bobs Her Hair. Miniature ballet dress made from a paperback bodice ripper with petal skirt and faux pearls. 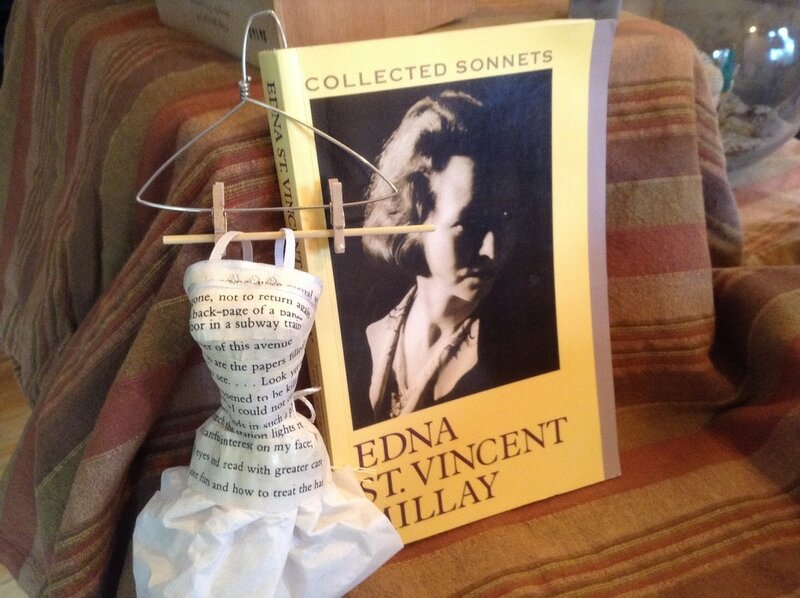 Miniature dress made from the sonnets in Edna St. Vincent Millay's Renascence.